Meet the Winners: Tiny Jane Scholarship – RBCoYP! Even after Jane Jacobs’ death, she continues to have an impact on how individuals view the built environment and its impact on communities. The Tiny Jane Project pays respect to her life’s work and presents a fun way to spread preservation/planning awareness. Sixty Tiny Jane dolls were sewn by project founder Sarah Marsom with the assistance of Young Ohio Preservationist board members and sold with 100% of profits being donated to the first Tiny Jane Scholarship. Representatives from RBCoYP organizations reviewed dozens of scholarship applications and selected five emerging professionals to receive a $200 stipend to assist with registration for PastForward, the National Trust for Historic Preservation’s annual conference. Who you are: Jim Gonzalez; Preservation Intern at Toledo Revival. BFA in Fashion Photography from the Academy of Art University. Previously spent two years as the Social Media Coordinator, and served on the Preservation Grants Committee of the Victorian Alliance of San Francisco. 2016 Alum of the Victorian Society in America’s Newport Summer School. Where you live: Toledo, Ohio as of August 2017. Previously, the San Francisco Bay Area. Your favorite historic/cultural building or landscape or food or what have you: Though I haven’t visited DC yet, my favorite building is the Eisenhower Executive Office Building. It’s the structure that first introduced me to my favorite architectural style: Second Empire. What you look forward to most at the PastForward Conference: It’s a simple answer, but: learning. Who you are: Amelia Decoster; I received a Bachelor of Arts in Psychology in 2013; and began the Masters of Fine Arts Historic Preservation program in 2014 at the Savannah College of Art and Design in Savannah, Georgia. I am currently finishing my thesis. In October, I will be presenting my thesis as a Student Scholar at the Association for Preservation Technology Conference in Ottawa, Ontario. Favorite historic/cultural building or landscape or food or what have you: I am really interested in opera houses — all kinds! American, European, grand, humble, etc. What you look forward to most at the PastForward Conference: I look forward to meeting the other young and emerging professionals; I am excited to hear what they are doing and how they are contributing to preservation. Who are you: Jacqueline Drayer; I am the Outreach and Grants Manager at the DC Preservation League. My work includes just about anything related to preservation advocacy and education, and I have a background in architectural research. I love adaptive use, photographing cities, and eating ramen. Where you live: I live in Washington, DC. It is a wonderful city for historic preservation because of strong preservation laws and 250 years worth of diverse architecture. Washington is more than the Capitol and neoclassical buildings! Favorite historic/cultural building or landscape or food or what have you: A few of my favorite structures are St. Paul’s Cathedral in London, River Park Mutual Homes in Washington, and the Moses Bridge in Halsteren, the Netherlands. 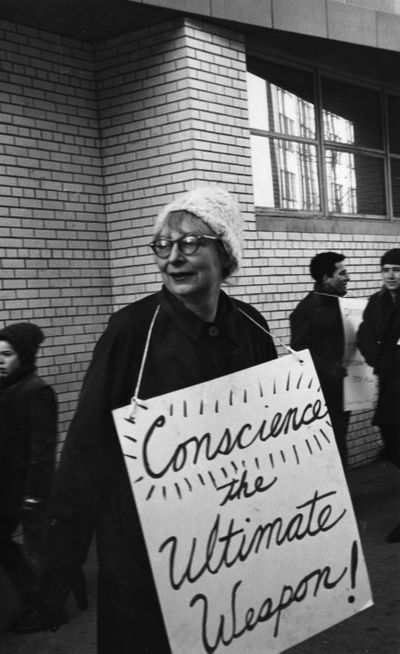 Favorite Jane Jacobs quote, picture, or story: My favorite Jane Jacobs photo is this one. The era of protesting preservation issues peaked before my time, so it’s hard not to romanticize it. Her poster is also a perfect universal sentiment. What you look forward to most at the PastForward Conference: I look forward to learning about how others are encouraging new swaths of their communities to join preservation efforts in creative ways. Where we can find you on social media: My personal Instagram is @jackie.bird and I manage DCPL’s account: @DCPresLeague. Who you are: Kyle Anthony-Petter; I will be a senior at Southeast Missouri State University majoring in Historic Preservation, with a minor in history and architectural design. I grew up in Saint Louis, Missouri. Favorite historic/cultural building or landscape or food or what have you: My favorite historic landscape is Faust Estate in Saint Louis, which shows early 20th century domestic architecture of agriculture structures. The structures were built by many prominent architects from the Saint Louis area. I enjoy the landscape surrounding the buildings which forms and unifies the structures with their surroundings. What you look forward to most at the PastForward Conference: What I am looking forward to the most about this conference is meeting others from all over the country. It will be great to learn more about historic preservation from different people’s perspectives. I am excited about first PastForward conference. Where we can find you on social media: I can be found on Instagram @historic_prez and on facebook at Kyle Petter. Who you are: Tim Wood; I’m a MS student in Historic Preservation with a focus on cultural resource management at the University of Oregon in Portland, Oregon. Favorite historic/cultural building or landscape or food or what have you: My favorite historic/cultural landscape is the Columbia River Gorge with its many hiking trails, waterfalls, and scenic views. What you look forward to most at the PastForward Conference: I am very excited to attend the PastForward to meet with fellow preservationists and discuss how the field of historic preservation is evolving and what we see on the horizon. Information regarding 2018 scholarship applications will be announced January 2018. For more information visit tiny-jane.com! We would also like to thank Heritage Ohio for being the fiduciary of this passion project.